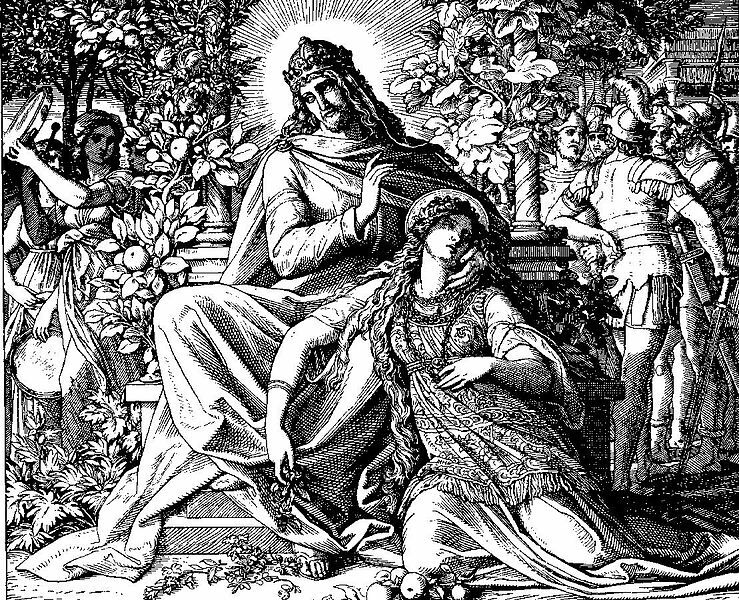 Depiction of Solomon and Pharaoh’s daughter reciting the Song of Solomon. Editor’s Note: In honor of Valentine’s Day, the Saturday Poetry Series offers you a good old fashioned love poem, emphasis on the old. An anomaly among the fire and brimstone, monotheistic propaganda, and general prescription of the Bible, the illicit sexual nature and unbridled romance of The Song of Songs has baffled scholars for centuries. Believed to have been written some time between the tenth and second centuries BCE, there is no authoritative agreement regarding the poem’s authorship, inception, or setting. The subject matter of the poem itself has long been heatedly debated, with some scholars embracing the titillating nature of this epic poem, while others insist it is a metaphor for man’s love of God. While its milder language is often quoted in the context of weddings, showcasing a true love with ancient roots, when one sits down and reads this masterpiece from beginning to end—with eyes wide open—they encounter a hot and steamy poem that gives Fifty Shades of Grey a real run for its money. Want to read more about Biblical poetry? This entry was posted in King Solomon, The Song of Songs and tagged Biblical Poetry, Celebratory Poetry, Classic Poetry, Formal Poetry, Literary Poetry, Love Poetry, Poetry, poetry in translation, Poetry International, Poetry of Faith, Romantic poetry, Spiritual Poetry. Bookmark the permalink. ‘An anomaly among the fire and brimstone’~~~A pity little (peace), most probably penned by a woman. A woman, desirous of her paramour~~~ celebrating the lusty months that lead to May. Excellent choice for V-Day, for any/every day. Thank you, Sivan. Interesting you link this poem to the Queen of Sheba. I interpreted the same in my novel.